Light air start and finish, fresh breeze and warm sunshine in between. 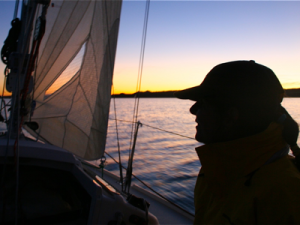 26.2 mile course, long spinnaker runs, and a lot of fun during a beautiful December Arizona sailing day. Great job by crew Sheila Reed and Craig Quist to get us back in the race and among the lead boats after a disastrous early split from the fleet, (which seemed like a good idea at the time.) Then again, being last paid off when the wind filled in from the south, got to us first and reversed the first leg from an airless upwind drifter to a downwind romp. We hoisted the 1/2 ounce chute and started passing boats.